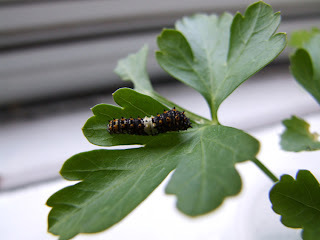 Well, I meant to document our swallowtail's progress more thoroughly on my blog here, but Speedy is just zipping through her instars way faster than our swallowtail charges last year. 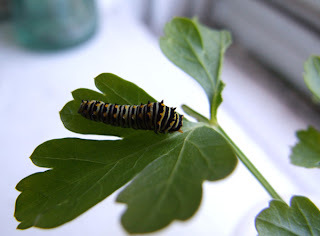 Or maybe it only seem faster because this is our second year with swallowtails, so we're old hands at it now, or because this year we only have one and not six to worry about. But, wow, she's gotten really big really fast. When we brought her inside she was just in her first instar, and just last night she molted into instar #4. Here's a few photos. I don't know if you can quite tell from this photo, but while she no longer has the big, obvious white sash around her middle, the corresponding area is still slightly paler than the rest of her. She's got one more instar to go as a caterpillar, then she'll spin her chrysalis. In instar five she'll be (again) bigger and fatter, and the stripes will be more prominent and the little spikies she still has in I4 here will smooth out. I haven't been around to actually see her molt, which is a shame because it's a neat thing to see. First they loosen their head capsule and knock that off, then they accordion scrunch themselves out of their old skin, and then after resting for a moment they turn around and eat it. Hey, waste not want not. If you look in the background of my photos here, you can also see how much parsley she's been eating, since she's on the same stalk of parsley in every photo. There were three full leaflets when she started out in I2, and as of this morning she's eaten one and a half of them (she also ate close to a full leaflet from the stalk that she hatched on). 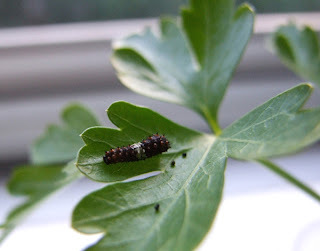 Gardeners sometimes refer to this critter as "parsley worm" and dispatch it with other pests. Black swallowtails are under no real danger as a species, and while I'll admit that a lot of them could do a number on a garden, that's still no reason to wantonly kill pollinators.